Lenovo, a global technology player and one of the world’s leading PC and Tablet brands, has unveiled its latest collection of future-ready laptops today. The new range consists of stunning, ultra-sleek devices, offering powerful computing to today’s millennials. The entire portfolio offers some really cool, next-generation features that are unmatched in the industry. Features such as AC 2*2 Wifi connectivity, Type C USB ports and immersive audio are yet to be seen even on premium notebooks that are currently available. With up to 7th Gen Intel® Core™ i7 processor, the Lenovo Yoga 720 packs style, performance and convenience for multi-taskers who seek high productivity and lightning-fast responsiveness. With a sleek finish and aluminum design and weighing only 1.25kgs at 0.75" (19 mm), the Yoga 720 is a perfect companion for a dynamic lifestyle. The Lenovo Yoga 520 is another stylish addition to the Yoga line-up with up to 128G PCIe SSD + 1TB SATA HDD hybrid storage. 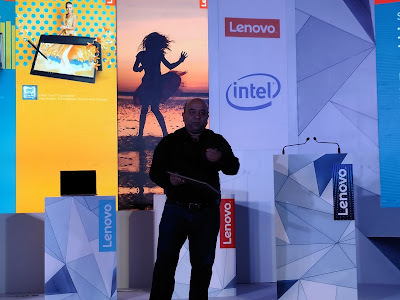 Lenovo products can be experienced at the wide network of Lenovo Exclusive stores and multi brand stores such as Croma, Reliance Digital and Ezone.